Life as a blogger is usually not very glamorous. But sometimes, it is! 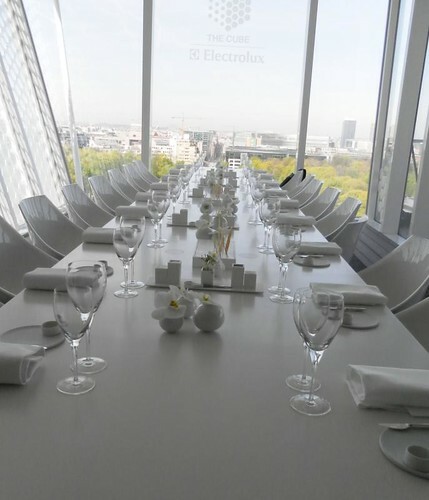 I was invited to visit The Cube, a pop-up restaurant by Electrolux - in Brussels, which is the first stop. It will later appear in Italy, Russia, Switzerland and Sweden, each time different since it'll be run by different chef. The Cube experience will probably be very different in the various locations. 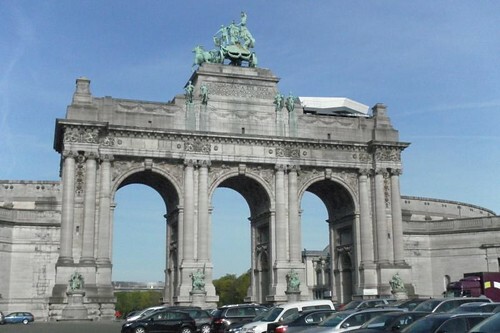 The structure itself remains the same, and judging from the cool location in Belgium, it will probably be pretty spectacular in every city it visits. And I know some excellent chefs are booked to work with it, so I imagine the food will be awesome as well. It's open for lunch and dinner, and is reservation-only, since it only seats 18. 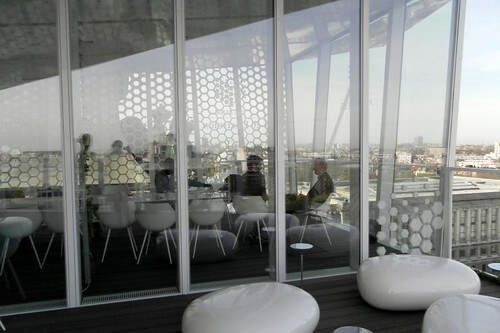 Those 18 all sit at a long table (made from corian - I loved this, it was very futuristic yet practical), and together share a "complete experience" - not just food, but also music chosen by the chef. The Brussels cube had iPad2:s, so that the diners could take photos of each other and e-mail them - I found that quite amusing, if not exactly necessary. 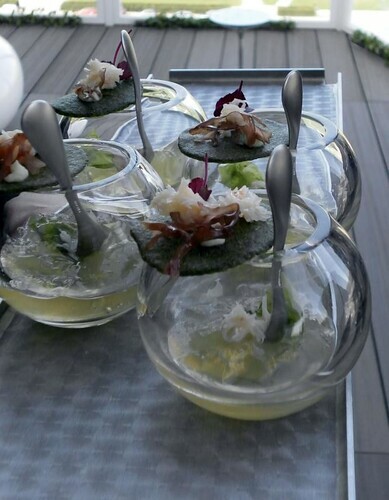 We had champagne and amuse bouchées on the deck. 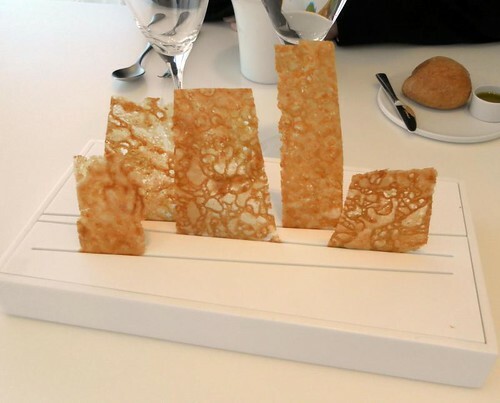 I loved the first one - a delicate cracker filled with parmesan cream. The following ones, a bit less. Tandoori crackers with foie gras and beetroot. And an olive cake with anchovies, almonds and garlic confit. 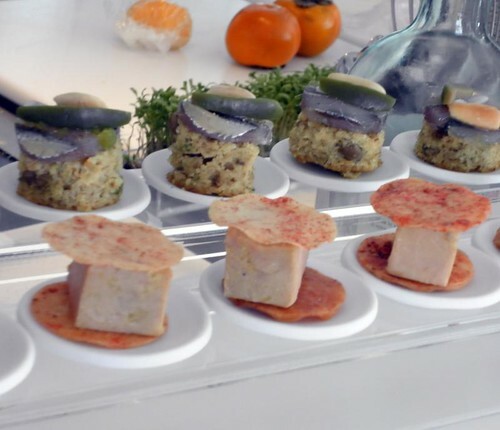 I'm just not a foie-fan, and anchovies are not really among my faves either. This one - well, I'm not completely sure what it was. 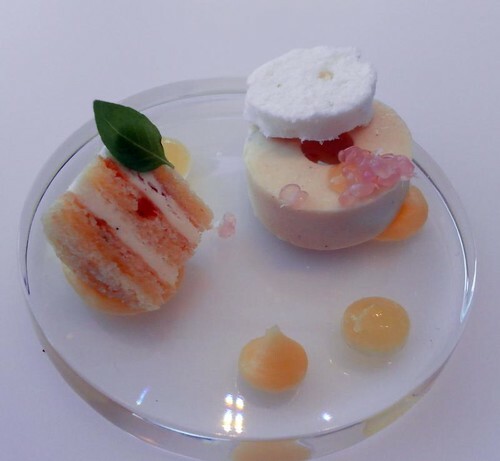 My notes say nori jelly with dashi cracker and crab. I didn't finish this, because algae jelly? Sorry, not for me. (I know, I'm way picky to be a foodie!) It was pretty though! So was this: crispy chicken skin! I love the serving dish, obviously designed for this one thing. It was served with this appetizer, which had roast beef, some sort of chutney and macadamias. Tasty! And on very unique piedestal-plates, inspired by (if I heard correctly), Brussels water tower. Next came a light dish with smoked haddock, beer bouillon, horseradish and, I think, hop sprouts. 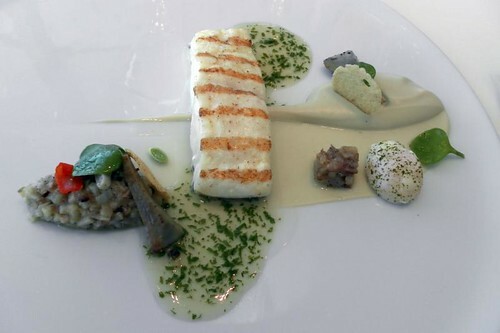 Grilled turbot with artichokes, and a tangy risotto. A little quail's egg, too. Good! I love artichokes! We moved on to desserts, and were surprised to see the chefs come out wearing heavy raincoats. 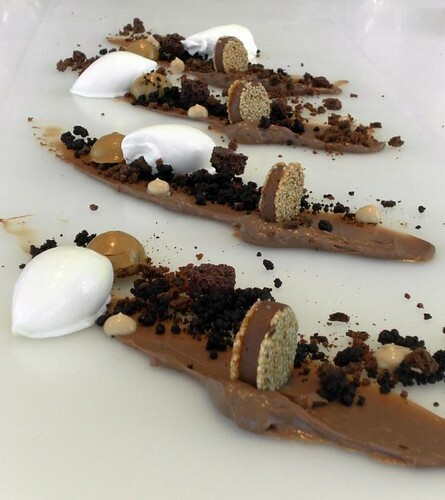 They rolled out a sheet of silicone on the table, and started to plate the dessert right there, on the table. 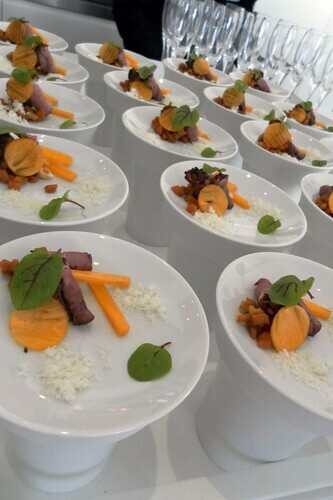 It was very artistic - Bart said that he was inspired by Grant Achatz of Alinea for this dish. It had chocolate mousse, some sort of chocolate cake, aerated chocolate, a sesame cracker with truffle and sea salt, and an ice cream which was smoked somehow. 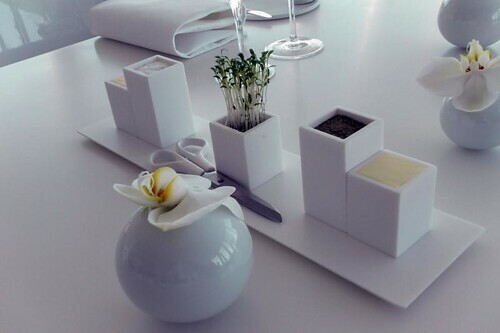 We were then offered infusions of mint or lemon verbena, which were actually growing in planters inside the Cube. 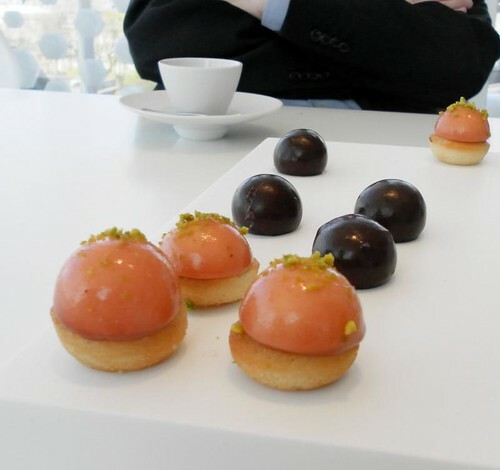 With them, this tray of treats - a chocolate sphere with vanilla cream (I think this was called a Dame Blanche?) and something with strawberry-passionfruit-pistachio. Both awesome. Next, total awe as the servers lifted the trays and revealed five more little bite-sized treats. 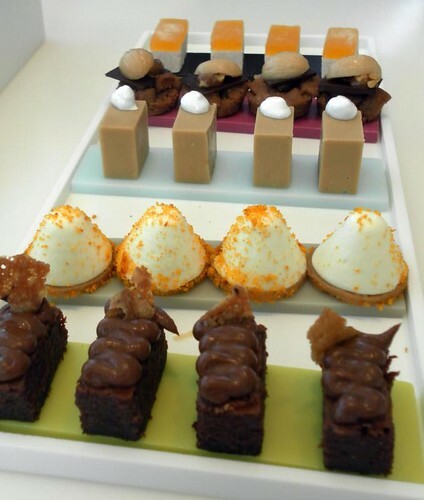 I don't know for sure what all of them were, but I know the one in the back is speculoos-mandarin in a sort of marshmallow texture, we had something with chocolate and hazelnut, something with white chocolate and peanut butter, a lemon cheesecake and something more chocolatey. At this point, I didn't think I would ever eat again. 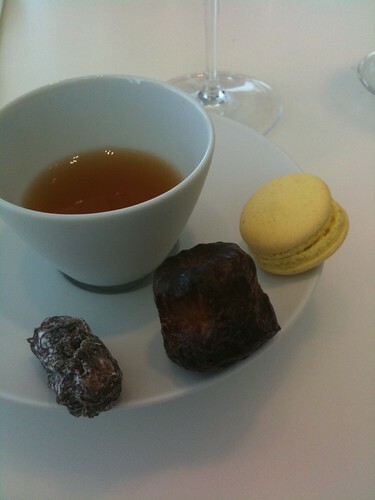 Yet, somehow, I managed to eat a lemon macaron, a canelé, and a chocolate truffle. I was overwhelmed. I asked chef de Pooter to pose for a photo with me. He was very friendly and quite happy to oblige. I think I'll start collecting photos of myself with chefs - cheesy, but a little bit fun, right? Whew. What a meal. And what a day. 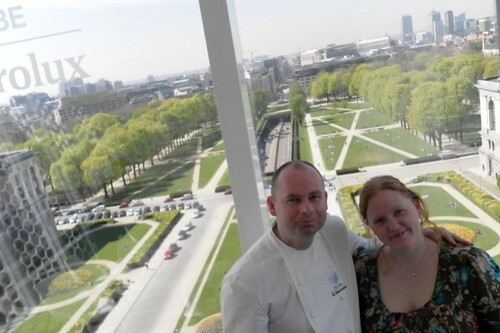 It was a lot of fun, and I hope I get a chance to eat at the Cube when it visits Stockholm - it'll be manned by members of Sweden's culinary team, so I'm sure the food will be top-notch. Wow, wow, wow! This must've been a really amazing experience! Thanx for the pictures 'n report, you are so worthy this kind of luxury Anne! I love your blog, always entertaining and fab pictures! 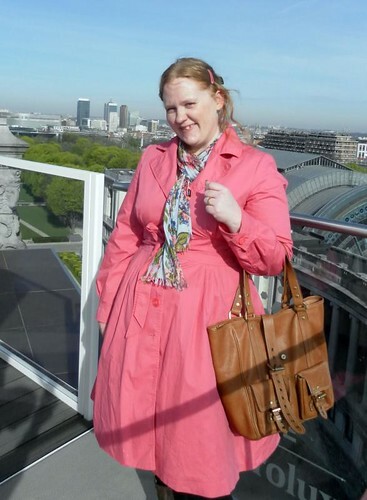 Thank you for taking the time to post all these keen pictures and love the pink dress! Jag är minsann inte alls avis. Nej. where do i begin!!! those dishes all look unreal. Especially the desserts.. :) Lucky lady to see all of this!